Cookery competition. Trying to impress judges John and Gregg are Boyzone star Shane Lynch, actor Brian Capron, comedian Shappi Khorsandi and TV presenter Miranda Krestovnikoff. The hunt continues in this third heat week as we welcome four new celebrities to the challenge. Trying to impress judges John Torode and Gregg Wallace are Boyzone star Shane Lynch, actor Brian Capron, comedian Shappi Khorsandi and TV presenter Miranda Krestovnikoff. The first challenge is the infamous Mystery Box Test. Requiring technical skill and a creative flair, the celebrities must design their own unique dish from a range of mystery ingredients, including a whole saddle of goat. With only one hour to create their dish, they will have to think fast if they're to impress the judges. But there's no time for complacency, as the contestants face their second challenge for the day - the fearsome and celebrated Palate Test. John demonstrates to the viewers at home a deceptively simple tomato tart with herb salad. Without seeing the demo the celebrities are given just a few minutes to taste this dish, before being asked to write down exactly what is in it, using their sense of smell, and palate. Then they are asked to recreate John's dish in just 50 minutes - without a recipe. 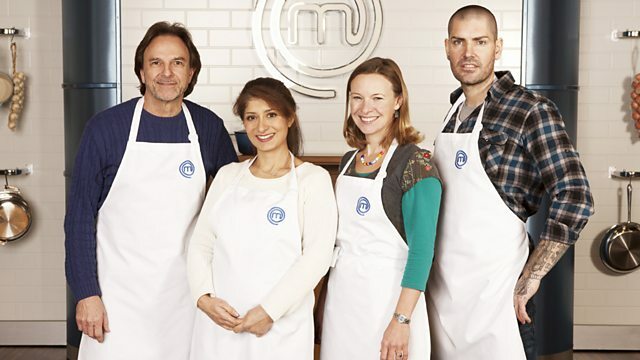 Finally, the four hopefuls leave the MasterChef kitchen for the first time as they are thrown straight into the highly pressured world of mass catering. With over 100 hungry students to feed at Goldsmiths College, the celebrities will have to be on top of their game. With ingredients including beef, pork, pasta, rice, and a range of fruit and vegetables, the teams must prepare meat-based, vegetarian and dessert dishes in just two and a half hours. In the heat of the kitchen, and with a college of hungry students descending upon them, the celebrities must rely on their teamwork skills more than ever to triumph. All the recipes from the latest series of Celebrity MasterChef. Amateur cooks compete to win the coveted MasterChef title.